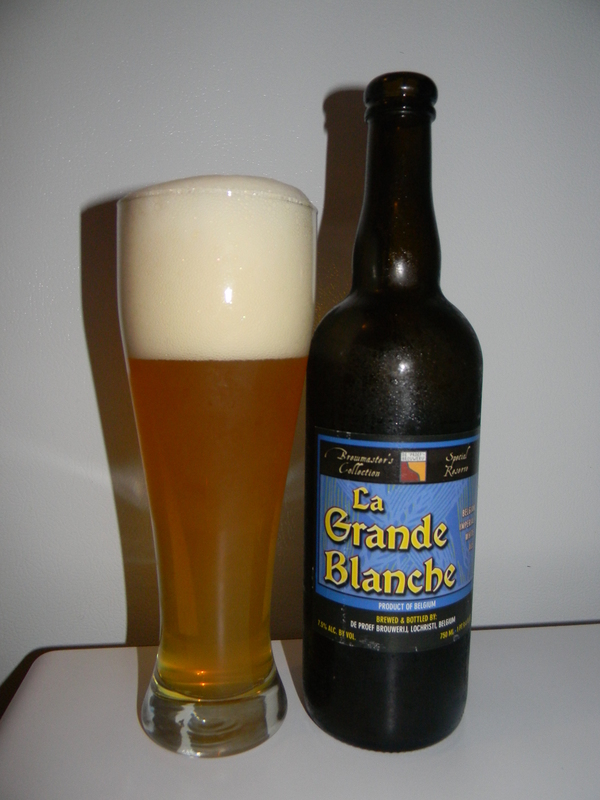 Review of De Proef La Grande Blanche | Beer Apprentice - Craft Beer News, Reviews, Interviews and Info. Hello again everyone. It’s time for another craft beer review. Today, I’m going to be sampling the De Proef La Grande Blanche concocted by De Proefbrouwerij (bvba Andelot) located in Lochristi-Hijfte, Belgium. I must say that I’ve really enjoyed the De Proef brews that I’ve had thus far. They really make some tasty beers, therefore I’m really looking forward to trying this one. I wasn’t able to find a commercial description of this beer, but be sure to check out there website, proefbrouwerij.com, anyway for some nice insight on the brewery. Let’s just get it poured and see for ourselves what it’s all about. This brew came in a 25.4 oz. bottle and it had a 7.5% ABV. It poured a very hazy, honey/yellow color with some bright yellow highlights at the bottom of the glass. It formed a billowy, frothy, soapy white head from a medium aggressive pour. It was sized great and the retention time was excellent. The lacing was a bit patchy, however it hung on to the sides of the glass fairly well. The nose released tones of lemon citrus and orange in addition to some subtle spices of coriander and pepper. Furthermore, hints of grain, wheat and yeast added an almost hay type of aroma. Overall, the nose seemed relatively bright and well balanced. Fairly typical for a beer of this style in my opinion. The taste seemed fresh. Soft citrus of orange and lemon commingled with more of that coriander and light, white peppercorn. However, the flavor was much more pronounced with the yeasty and bready aspects. Not that it was a bad thing, but I was kind of wanting the fruitiness to stand out a bit more. Oh well. The mouthfeel was medium to light bodied. Very crisp, refreshing and thirst quenching. It was a tad bit watery, but the carbonation was lively and spritzy. The flavor, unfortunately, vanished from the palate kind of quickly after each swallow. Well, this was decent beer. I don’t think it is quite on the same level as the other De Proef beers I’ve tried, however it is a different style and White/Wit beers have never been one of my favorites anyway. Other than that it was very easy to drink and it would be an outstanding, refreshing beer for Summer. It didn’t provide anything out of the ordinary, but it still had enough flavor and kick to get the job done. So, if you guys get the chance, try the De Proef La Grande Blanche and see what you think. You may really like it. Thanks for reading and commenting everyone.